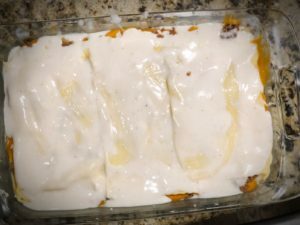 Several years ago, I discovered a butternut squash lasagna recipe from Giada de Laurentis that quickly became a staple at my Thanksgiving dinners. 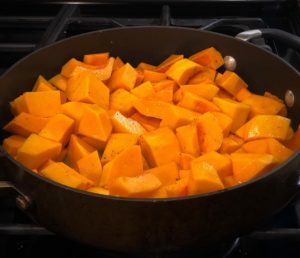 The combination of butternut puree, noodles, and a basil bechamel was such a fun savory addition to the holiday table. 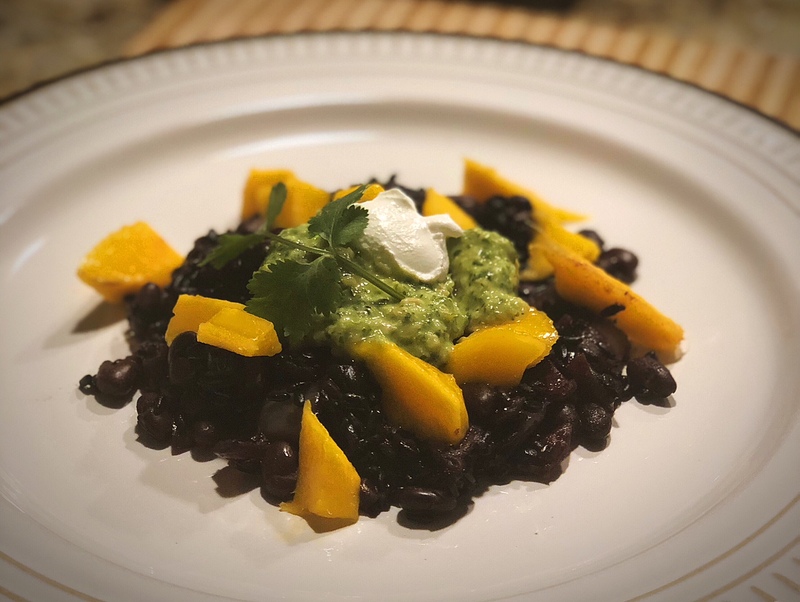 For quite some time, I’ve been wanting to recreate/reinvent a meal that my boyfriend and I made on one of our early dates (in the midst of a North Carolina hurricane, no less). We rolled pappardelle noodles by hand, whipped up some Italian sausage meatballs, blitzed a pesto from browned butter, sage and hazelnuts, roasted up some butternut squash, and tossed it all together. 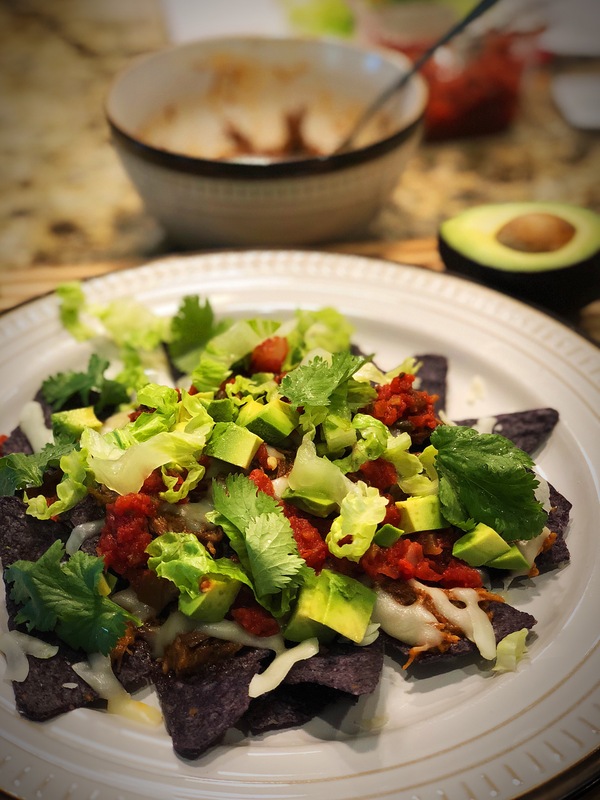 The flavor combination was incredible – the perfect savory dish to provide comfort and delight while the storm raged outside. It’s easy to look back at a meal like that and wonder if it was the setting (the excitement of those early days of a new relationship, the anxiety of losing power – or trees – in the midst of a storm, the adventure of making fresh pasta for the first time) that made it so delicious and memorable. 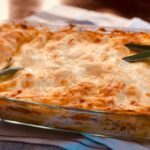 But after reinventing these flavors into a lasagna inspired by the original Giada version, I can safely say that this combo is tried-and-true and will make you fall in love with savory goodness time and time again. 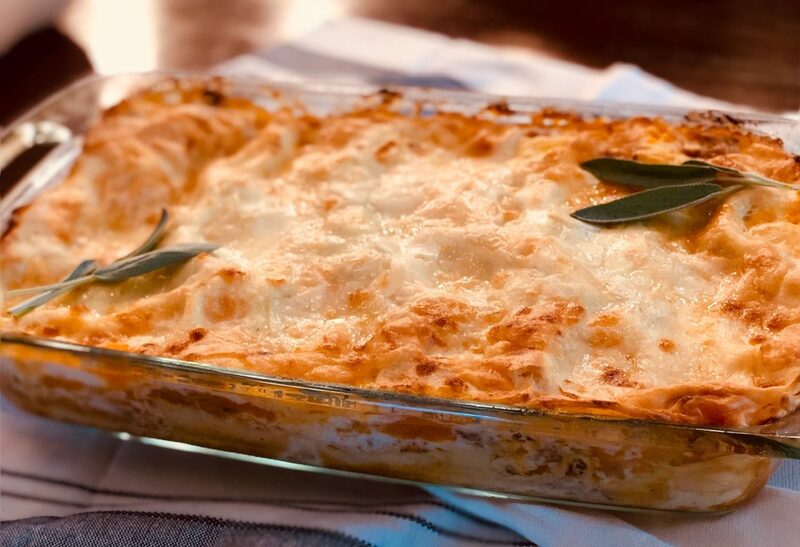 Liven up your holiday dinners with this savory fall dish that melds the sweetness of maple syrup, butternut squash, and brown butter with the slight spice of mild Italian sausage in a fun twist on a familiar comfort food classic - lasagna. Prepare all components of the lasagna. Melt ½ cup butter in medium saucepan over medium heat. Add 30 sage leaves. Fry sage as you brown the butter. The butter solids will separate, the top of the butter will start to foam. You want to be careful not to burn the butter, but you do want it to turn a nutty brown color when you swirl the pan. It will smell nutty too. Once you have reached nutty brown stage, remove pan from heat and use a slotted spoon to remove sage leaves. Drain leaves on a paper towel, set aside. Return butter to medium heat and whisk in ¼ cup flour. Whisk vigorously for 1 minute. Slowly add 3 ½ cups whole milk, whisking to combine. Turn heat up to medium-high and bring mixture to a boil, whisking frequently. Keep an eye on this because once it boils, it can foam up quickly and boil over. Once you see the mixture start to boil, turn heat back down to medium-low and continue whisking often. Cook for about 5 minutes until mixture thickens. Add a generous pinch of nutmeg (preferably freshly ground). Stir in salt and pepper to taste. Cover with lid or a layer of saran wrap (pressed down on top of mixture to prevent a skin) and set aside until ready to use. This can also be made a day in advance, though you’ll likely want to reheat it slightly over the stove before lasagna assembly. Heat remaining 1 tbs of olive oil in saute pan over medium heat. Add shallot and cook until just translucent, about 2-3 min. Do not burn the shallot. Add garlic and cook 1 minute more. Scrape onion and garlic into bowl and set aside. In same pan, add the ground mild italian sausage and brown over medium heat, breaking sausage up into small pieces. Once sausage is browned, turn off heat and stir in reserved shallot and garlic. Use fingers or mortar & pestle to crumble reserved fried sage. Stir sage into sausage. Set aside until ready to use. (Optional: Stir in ¼ tsp red pepper flakes. I like the addition of the heat, but this is a personal preference. 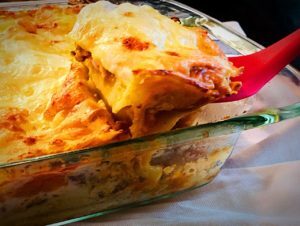 You can also serve the cooked lasagna with red pepper flakes on the side so loved ones can dial up the heat to their liking). Grate both 8 oz. 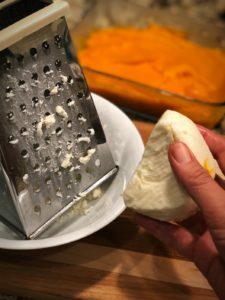 balls of fresh mozzarella on the large holes of box grater. This should yield about 3 to 4 cups of grated cheese. Set aside in a bowl. If using fresh lasagna noodles, you’ll want to boil noodles briefly in salted water for about 10-15 seconds to soften them. I like to do this in batches of 3 while I assemble the lasagna. If you prefer to boil all the lasagna noodles before assembly, you’ll want a couple large sheet pans handy so you can lay them flat after boiling and removing with a slotted spoon. Make sure lightly boiled noodles do not overlap on pans, or they will stick. No-boil noodles can be used dry and out of the box. Butter a 9x12 glass or metal baking dish. 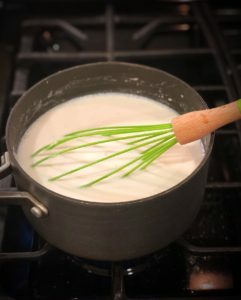 Spread ¾ c of bechamel sauce over bottom of pan. Follow with 3 lasagna sheets. 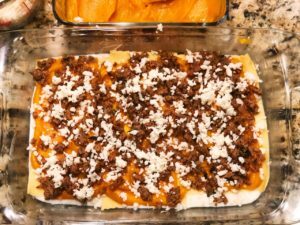 Cover lasagna sheets with ⅓ of the butternut puree. Sprinkle ⅓ of sausage over top of puree and follow with ¼ of the grated mozzarella (~½ to ¾ cup). Drizzle a ½ cup of bechamel over this layer. Repeat noodle, puree, sausage, bechamel steps twice more. Top off with last 3 lasagna sheets (4th layer of lasagna sheets) and spread over the last of the bechamel (about ½ cup). Cover dish tightly with foil. Bake at 375 for 40 minutes. Place a sheet pan underneath lasagna dish to catch any drippings that may boil over. After 40 minutes, remove foil. 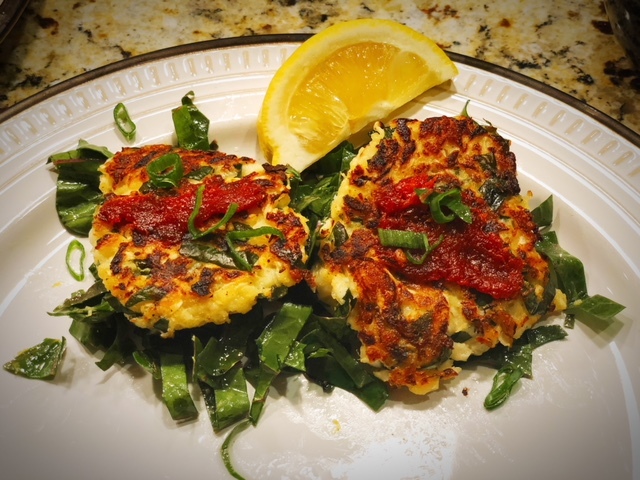 Top with remaining mozzarella (no more than ½ cup) and ½ cup shaved or grated parmesan cheese. Bake 15 minutes more or until top is browned. 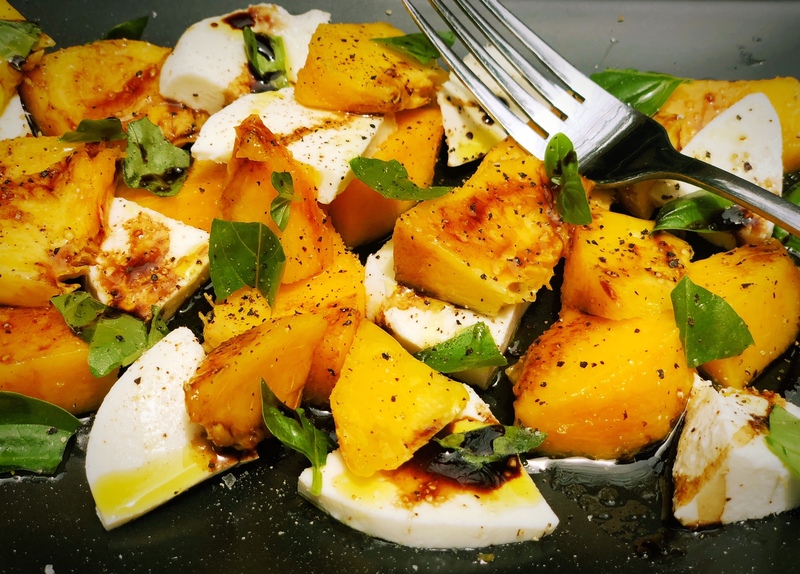 If, after 15 min, the cheese on top doesn’t have much color, you can turn the oven to broil, position a rack on the upper level of the oven and place the casserole under the broiler for a minute or two. Watch carefully as the cheese could burn quickly here. Allow to rest for 15-20 min on a cooling rack before serving.